Oh hey, we got a makeover! I’m totally pumped that the next evolution of Eat Spin Run Repeat is finally ready for the world to see, and I hope you guys are enjoying the new look too. My biggest goal was to simplify the design, make navigating around the site easier, and get rid of some old content. We’re still working out a few kinks (like my recipe plugin – that is a great big project that still needs tackling), but pretty soon things should be running super smoothly. Thank you so much for your patience if you were trying to access recipes over the weekend, and my apologies if you had any problems. 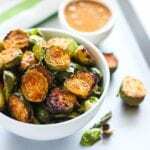 To celebrate Thanksgiving long weekend here in Canada, I’ve got a great bit Brussels sprout recipe roundup for you today. And yes, I know that for someone who doesn’t adore these as much as I do, this may sound as exciting as socks for Christmas. 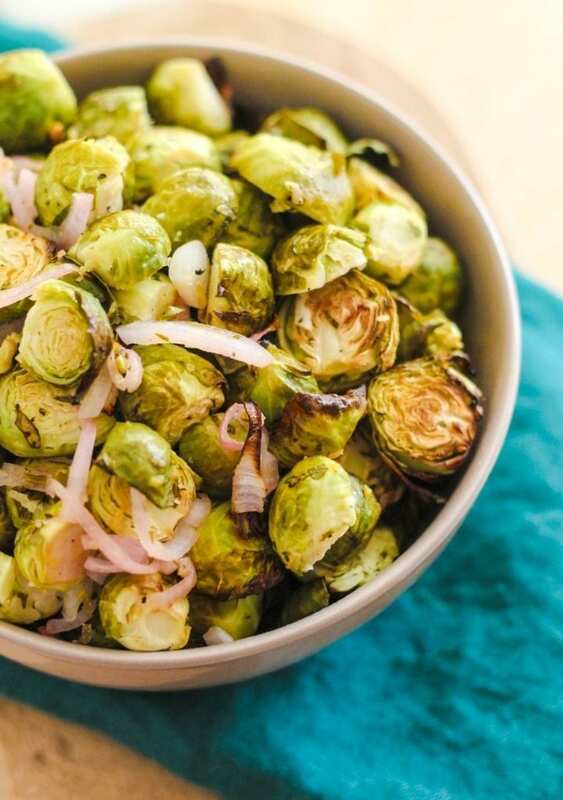 BUT… once you try a couple of these recipes, I think Brussels sprouts might just be right up there at the top of your grocery list. When it comes to veggie roasting, my fail-proof flavour combo of choice is a good mix of dark balsamic vinegar, olive oil and herbs. But as many of you know, I also adore Asian food. 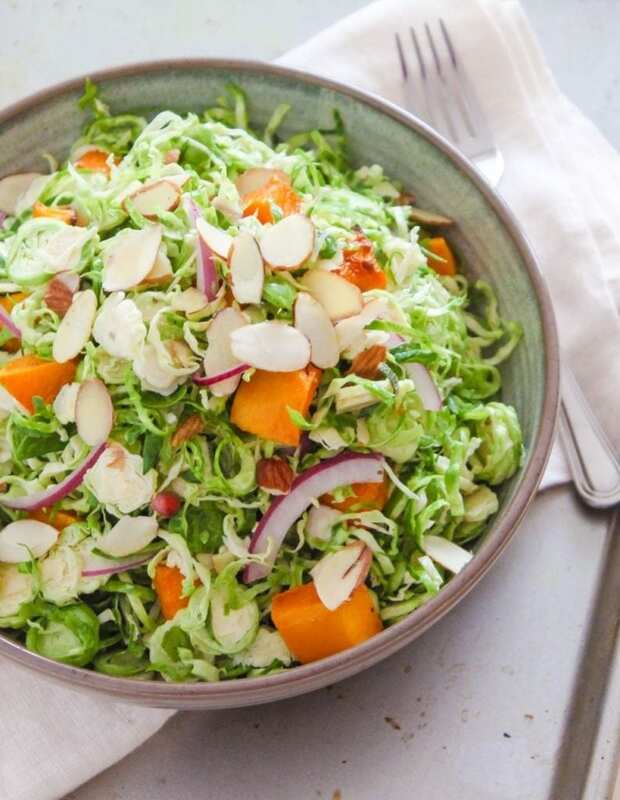 Therefore, the brand new recipe I mustsharerightthisminute with all of you is exactly that. 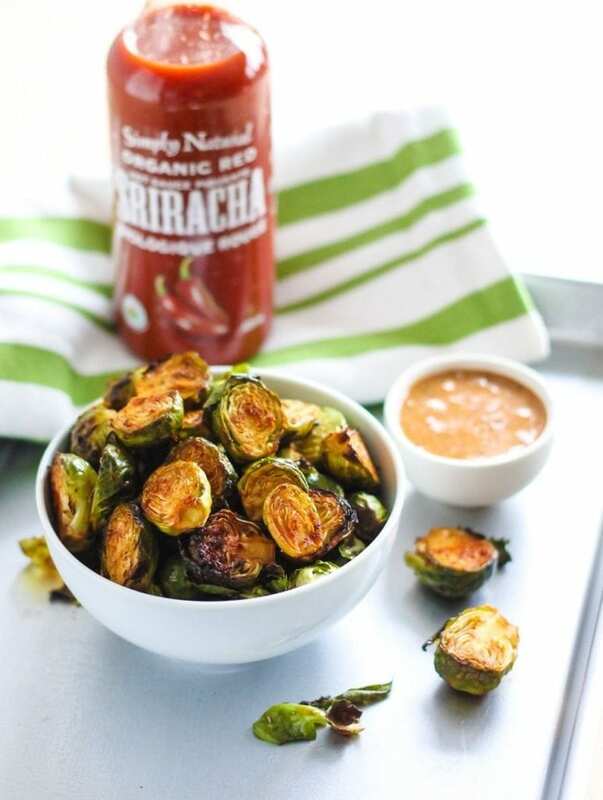 Sriracha fans, brace yourselves. Almond butter loving friends, you too. 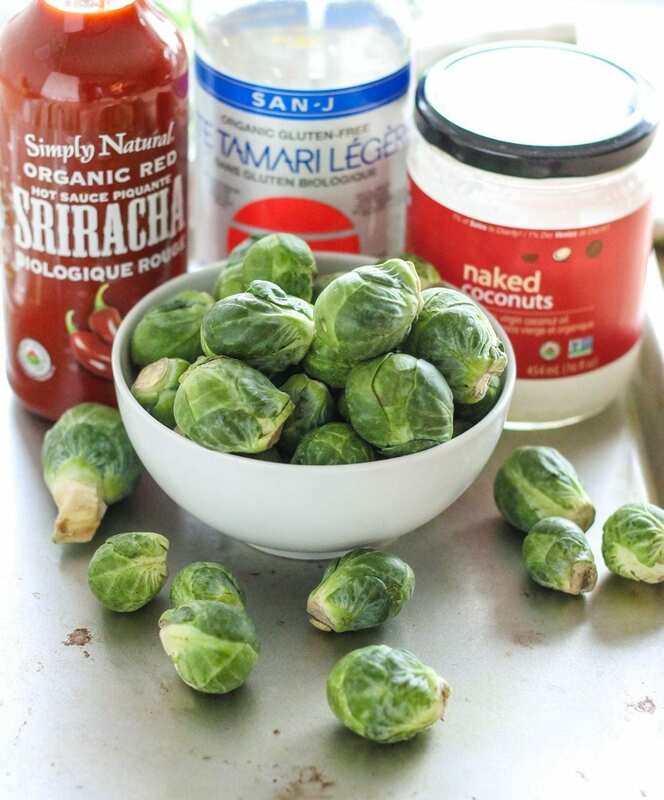 Here’s the deal: melt a little coconut oil and whisk it together with some sriracha sauce (my current fave is this organic Sriracha by Simply Natural which I found at Whole Foods) and low sodium tamari. 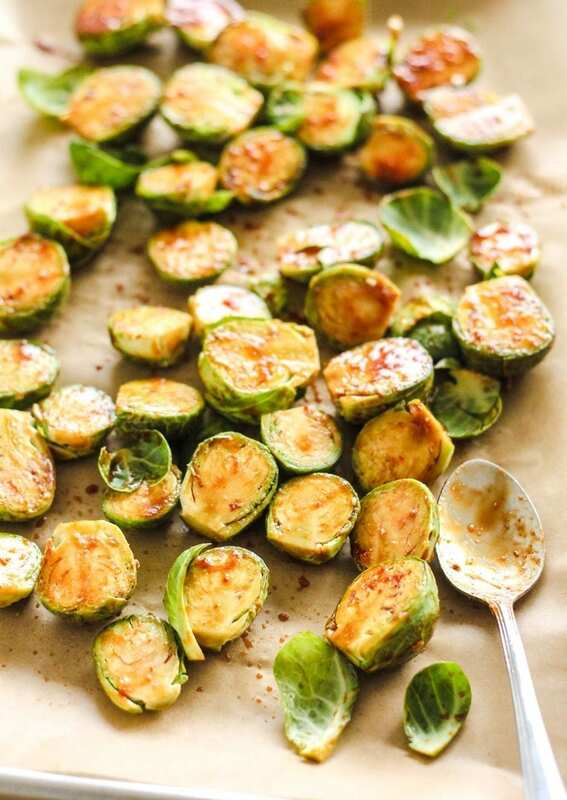 Then toss a bunch of trimmed Brussels sprouts in the saucy goodness. 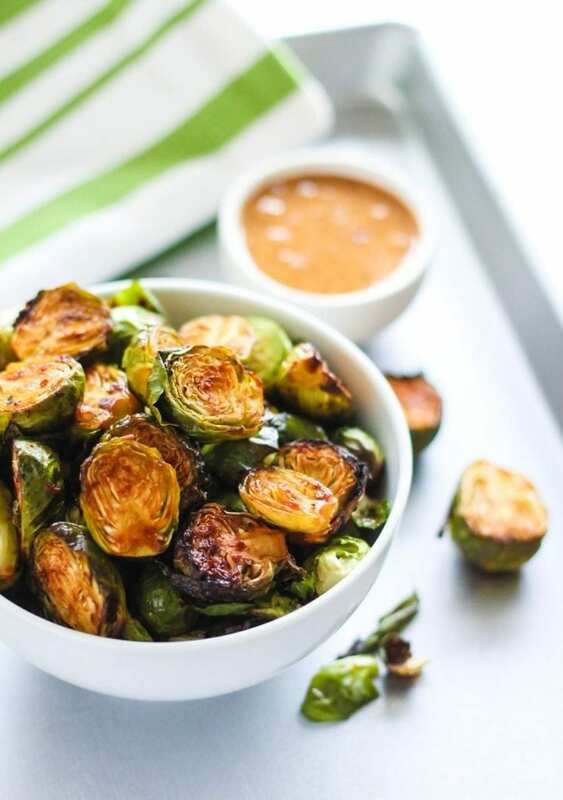 Roast the sprouts while you make an out-of-this-freaking-world almond butter dipping sauce that would probably make any vegetable taste amazing. Twenty minutes later…. 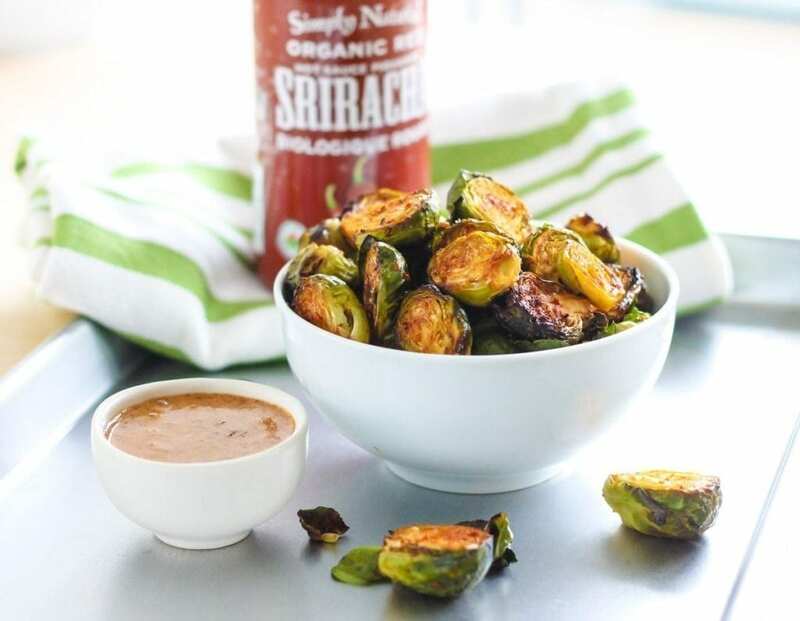 It’s a wonder these Spicy Sriracha Brussels Sprouts actually made it in front of the camera because most of them disappeared the second they were cool enough to eat. Quality control is of the utmost importance when you’re sharing recipes with people, ya know? 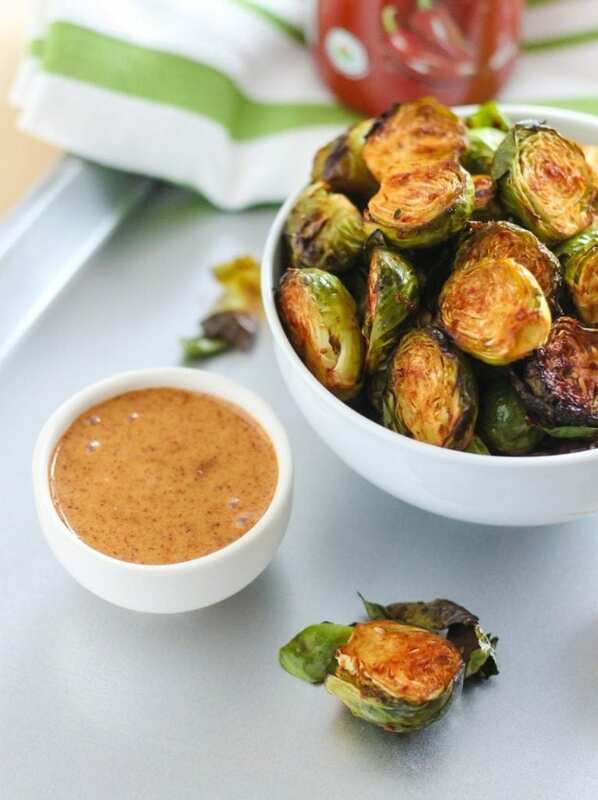 Crispy, spicy and nutrient-packed these Spicy Sriracha Brussels Sprouts with Almond Butter Dip are a strangely addictive snack. 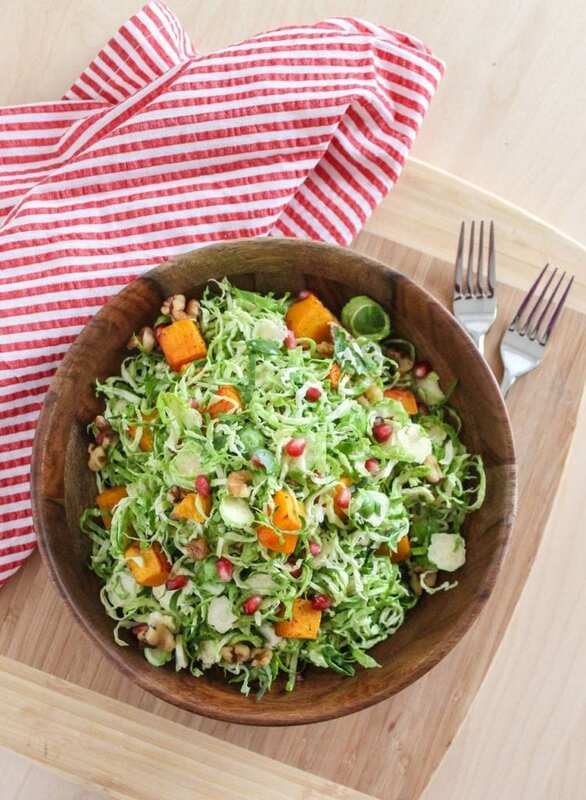 Gluten-free, paleo and vegan! 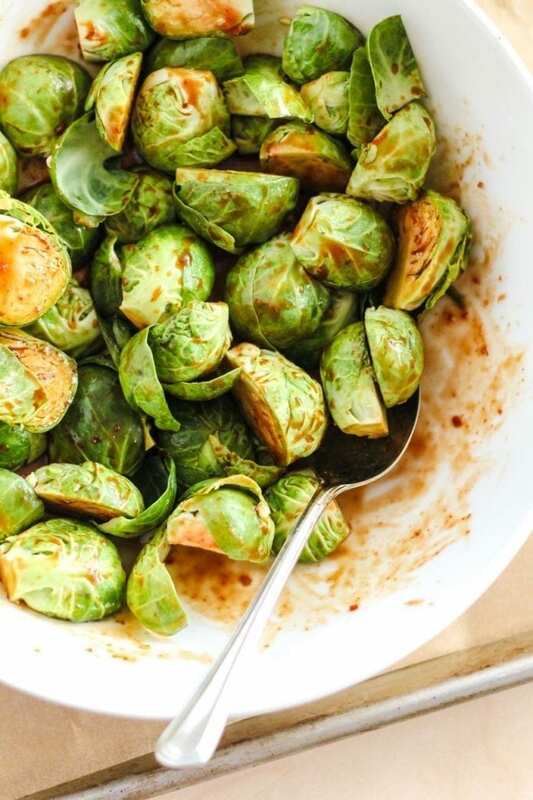 In a large bowl toss the Brussels sprouts in the coconut oil, sriracha sauce and tamari. 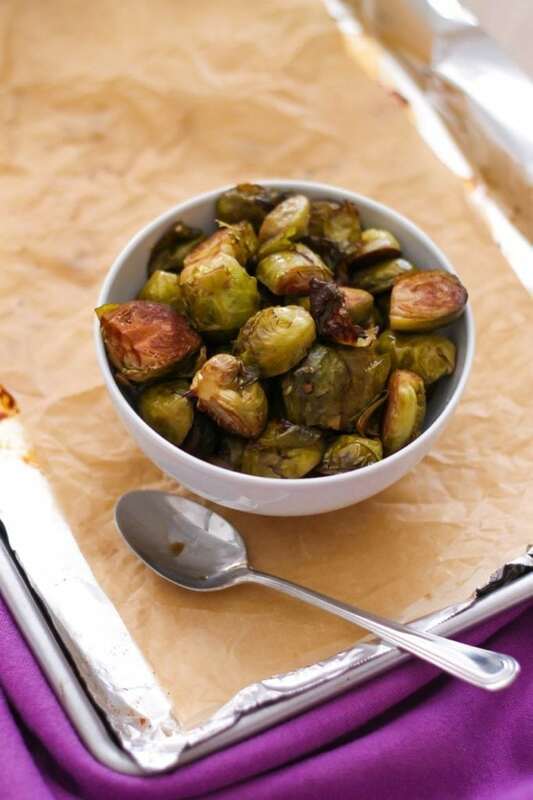 Pour the sprouts onto the lined baking sheet and roast for 20 minutes or until crispy. Pour the dipping sauce in a small bowl. 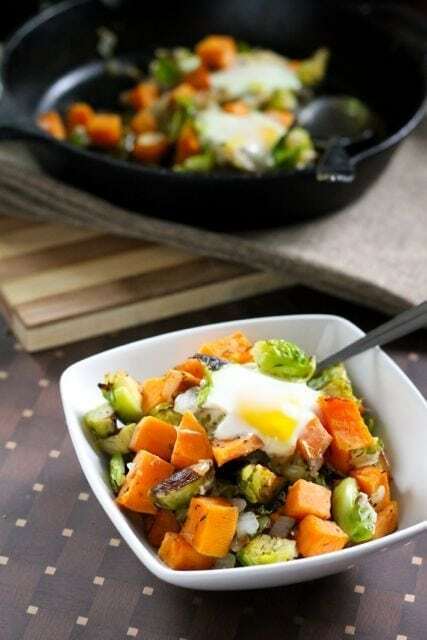 Serve with the roasted Brussels sprouts. And with that, I’m off for a workout and mani/pedi appointment with one of my besties. For all of my Canadian friends, I hope you enjoy your day off today. For everyone else, have a fab week! What were some of your Thanksgiving weekend highlights? 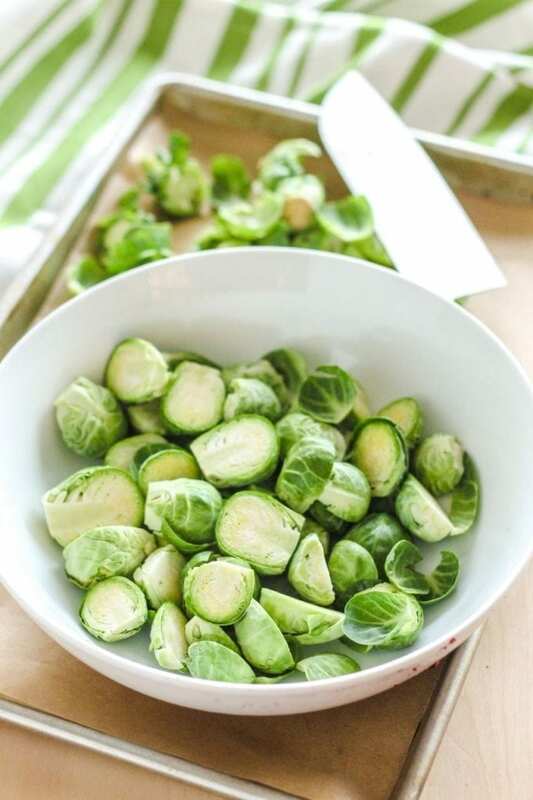 Favourite way to enjoy Brussels sprouts? ANGELA! The redesign is GORGEOUS! Congrats. Thanks lovely! Hope you had an awesome Thanksgiving on the east coast. The photos certainly look like it was. Say HBD to the birthday boy for me! Looks so healty,I’m going to try this Angela.Thank you!! You are most welcome, Sibel! Enjoy!